The young American Tenor launched his already successful career with his debut 2017 in La Traviata at the New York Metropolitan Opera, being immediately reengaged for Les contes d’Hoffmann and The Merry Widow in 2018 and Dialogues de Carmelites in 2019. He has also gained international recognition for the role of TIMOTHY LAUGHLIN in Fellow travelers, released this season on the Fanfare Label, and named by the New Yorker Magazine as one of the top 10 recordings of 2017. Aaron Blake recently made also a critically acclaimed debut with the New York City Opera in Peter Eötvös’ operatic adaptation of Angels in America. Blake has performed leading roles with Cincinnati Opera as DON OTTAVIO in Don Giovanni, PAN in La Calisto, and TAMINO in Die Zauberflöte. He appeared also as TAMINO with the Komische Oper Berlin, Minnesota Opera and at the Utah Opera where he returned as FERRANDO. As NADIR in Les Pécheurs de Perles, he was guest at the Tulsa Opera where this season returned as a guest on their 70th Anniversary Gala; as ROMEO in Romeo et Juliette he appeared at The Dallas Opera and with the Opera Orchestra of New York he sang UGO in Donizetti’s Parisina d’Este. He also was LORD HARVEY at the Washington National Opera in Anna Bolena next to Sondra Radvanovsky. Again, with La Traviata, he was ALFREDO at the Wichita Opera last season. He also performed the role of TAMINO with the Komische Oper Berlin on tour in Japan, Tokyo, Hiroshima and Osakaa, he returned to the Utah Opera for the Role of RINUCCIO in Gianni Schicchi, made debuts with the American Symphony Orchestra singing Fleishman’s Rothschild’s Violin at Carnegie Hall and was CANDIDE with the Atlanta Symphony-Alliance Theater in a production celebrating the Leonard Bernstein centennial. In the 2018/19 season the Tenor will return to the Metropolitan Opera for The Dialogues of the Carmelites, makes his role debut as COUNT ALMAVIVA in The Barber of Seville with the Tulsa Opera. He will also reprise the role of TAMINO with The Komische Oper Berlin on tour in Australia and New Zealand. Always as TAMINO, he will make his Lincoln Center Festival debut in July of 2019. He performs the US premiere of Martinu’s opera Julietta singing the lead tenor role of MICHEL at Carnegie Hall with the American Symphony Orchestra. In fall 19 he returns to the Met in Philip Glass’s Akhnaten, debuts with the Opera de Montreal as TAMINO and returns to Cincinnati Opera as ALMAVIVA in Il Barbiere di Siviglia. In 2020 he will sing the ALMAVIVA in Il barbiere di Siviglia for the first time at the Israeli Opera Tel Aviv. "Tenor Aaron Blake, who sang Michel, was a powerhouse that supplied a spark of energy into every note he sang as he led the audience into the darkest corners of his mind while Michel is in a mad search for Julietta. Blake radiated profound sensitivity, and was consistently expressive in all the right moments. A pivotal scene in the opera takes place in Act two, Scene six A, when Michel tries to remember if he actually shot Julietta. In doing so, he plunges into a mental spiral of infinite questions and questioning, where he loops back and faces his own worst fears. Blake was relentless in his mission to discover his character’s truth and sang with bold clarity and focus to the very end." "Mr. Blake – an endearing and sweet-sounding Michel, sung with youthful fervor and stamina – led an excellent cast. " "The odd story concers a Parisian bookseller (performed by terrific Aaron Blake) who visits a small coastal town where three years earlier he had become anchanted by a woman singing a love song, heard through an open window." "The cast of singers was top-notch throughout, with Aaron Blake as Michel and soprano Sara Jakubiak leading the ensemble." "Aaron Blake, as Candide, has an engaging, open-faced, youthful look perfectly suited to the role, and his acting skills make him totally believable as innocent, good-hearted Candide, letting him blend in seamlessly with the musical theatre veterans surrounding him. It’s only when the music starts and his glorious voice emerges that it’s evident his vocal training is at the operatic." "Tenor Aaron Blake (as Candide) beautifully delivers the impassioned ballad “It Must Be So.”"
"Aaron Blake is a charming Candide with a golden voice." "Aaron Blake captures Candide’s impossibly optimistic spirit with a soaring tenor voice." "The musical reflection of human speech and its psychological fluctuations are sometimes stunningly faithful. Aaron Blake brings an appealingly vulnerable, clear-toned tenor to Tim’s early appearances that are exquisitely calibrated. He rendered the trusting nervousness of his first encounter with Hawk on a park bench, the overeager jitters of his job interview — with vocal jumps overshooting their targets — and the heart-in-throat stammer he produces under the appraising gaze of Hawk’s female office staff. " "Timothy’s unhappy inner journey is the element that gives Fellow Travelers shape and focus, and at the premiere performance Aaron Blake delivered it in full. He cast an achingly vulnerable figure, never more so than when Laughlin ritualistically marked his renunciation of the affair by dropping a milk bottle off a rooftop: a moment both comic and tremendously poignant. The lyrical climaxes elicited a lucid, ringing tenor in full cry, but Blake never overwhelmed either the line or the text in sound: these passages were clearly sung by the same voice as the naturalistic recitative, but now overwhelmed by uncontrollable emotion. " "Blake was perfectly cast as Timothy. His tenor was clear and sweet, vigorous and lithe. He projected Timothy’s guilelessness, transparence, and sincerity. And he moved between disparate emotional registers with preternatural ease: longing, joy, sorrow. His performance was courageous. " "The leading men are both terrific. Aaron Blake’s tangy tenor and spot-on body language jolted the fragile, closeted Timothy to vibrant life. The only way I could be more impressed is if I had not seen him give essentially the identical performance in Angels in America last summer. " "...tenor Aaron Blake was touching and explosive as Tim. " "Tim is the center of the story in Pierce’s vision and Blake does well by him. I’ve seen Blake before and Spears’s brings out colors and warmth in his voice that I’ve never heard before. He has some of the opera’s best vocal music: His duet with Hawk when they first go to bed and his visit to confession were particularly memorable. As a character, he moved from innocence to integrity with ease. " 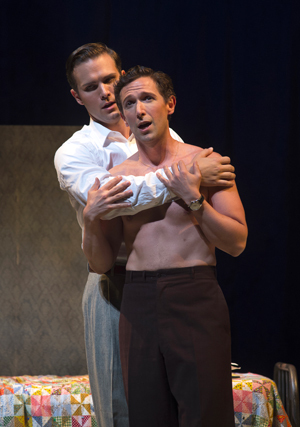 "Aaron Blake’s lyric tenor made the usually unsympathetic Louis touching." "As Louis, Aaron Blake brought a strong physicality to the role, portraying the character’s sexual lust as well as his guilt. Vocally the tenor had a gorgeous timbre…. One hopes to hear this tenor in a more traditional rep to see the capabilities of the lyrical voice." "There was aching depth to Aaron Blake’s interpretation of Louis, who combined a bright, creamy tenor and vocal intensity to give the finest singing of the night. 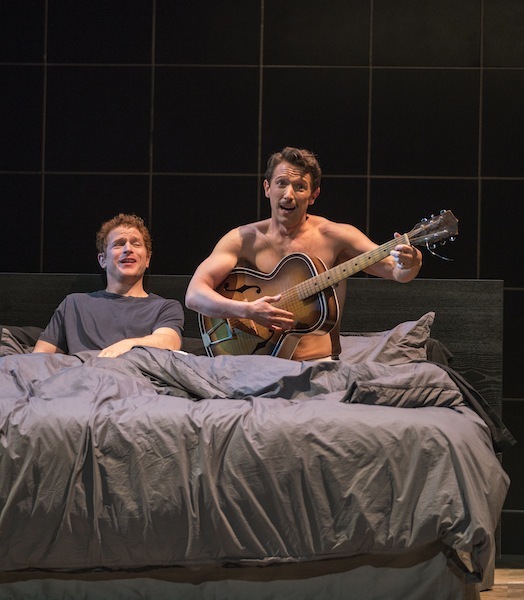 A magnetic actor, he crafted a vividly human portrait of the character as he struggled with whether he could support the man he loved during his illness. " "Aaron Blake as Louis Ironson was a revelation, demonstrating a rich trove of vocal abilities (belting, crooning, a floating falsetto) while giving a committed character portrayal. " "As Louis Ironson, Aaron Blake sang passionately and was convincing in his anguish. Eötvös’ and Mezei’s Louis is not neurotic and emotional, like Kushner’s. He is measured and still and lets his turmoil simmer below the surface. " "Blake’s command of Eötvös’ high tessitura, dynamic extremes and stylistic eclectism proved highly impressive. " "The opera’s protagonist, the young prince Tamino, was sympathetically portrayed by Aaron Blake on opening night. He has a compelling presence on stage, and there is a wonderful sequence where his soaring tenor voice is accompanied by animated creatures from the constellations, charmed by his magic flute." "Though the visuals dominate, the singers more than hold their own. Aaron Blake excels as Tamino, cutting a dashing figure and singing with effortless, smooth, gleaming tenor. " "The opera’s protagonist, the young prince Tamino, was sympathetically portrayed by Aaron Blake on opening night . He has a compelling presence on stage, and there is a wonderful sequence where his soaring tenor is accompanied by creatures from the constellations, charmed by his magic flute." "Opening night leads Aaron Blake and Iwona Sobotka, as the young lovers Tamino and Pamina are accomplished and often thrilling in their vocal agility, not the least for having the courage to sing on a ledge high above the stage. " "Aaron Blake was an engaging Tamino. " "Kim Lillian Strebel in silent movie mode is delicious as Pamina and her Tamino Aaron Blake is her match musically." "Aaron Blake (Tamino) and Kim Lillian Strebel (Pamina) are a sweet couple. They more than do justice to the beautiful music. " "Kosky’s Flute seems such a layered and multifarious dramatic fantasy, and partly because the singing is astonishing. It’s by far the most accomplished performance of the opera I’ve heard live and should attract opera fans on that score alone. " "Blake’s beautiful tenor voice effortlessly portrayed the hero Tamno with charm. " " Aaron Blake was a more-tham-usually robust-sounding Tamino, tackling the more heroic sections of the first act finale with aplomb but not lacking elegance elsewhere. "